A new study shows that urban heat island effects and increased urban aerosols can spur intense rainfall. 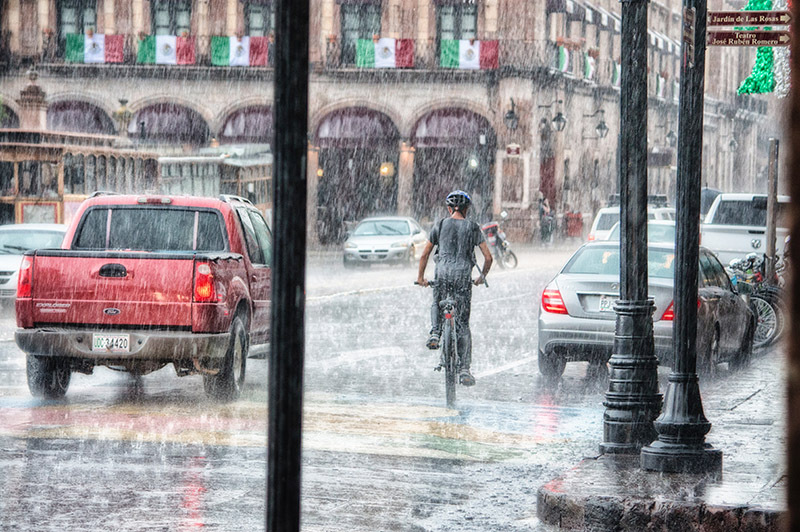 In urban areas, the combination of warmer temperatures within cities and more particles in the air can lead to heavier rainfall. Enlarge Image. In urban areas, the temperature is often a few degrees higher than surrounding areas; this is referred to as the urban heat island effect. Urban areas also produce more particles (aerosols) that enter the atmosphere and affect regional rainfall through their interactions with clouds and radiation. Using high-resolution modeling, in situ measurements, and satellite observations, researchers at the U.S. Department of Energy's Pacific Northwest National Laboratory led a study showing that urbanization can induce intense rainfall over cities from convective storms during the Indian summer monsoon. While the urban heat island effect induces more cloud formation over cities, urban aerosols modify properties of cloud droplets and act as a catalyst to further intensify rainfall over and downwind of the cities. This study provides a process-level understanding of how urban aerosols can prompt invigoration of city-scale rainfall. It also underlines the importance of including aerosol-cloud processes, in addition to accounting for urban land use, in models to better understand and predict extreme rainfall and flash flood events over cities. The findings have important implications for understanding extreme rainfall events around major cities and for water resource infrastructure planning. In South Asia, especially India, urban settlements are expanding, and intense flash floods over cities are increasing during the summer monsoon season. Researchers studied how urban land use and atmospheric particles affect rainfall in north India's Indo-Gangetic Plains, the world's most populated river basin. Using cloud-resolving model simulations, researchers found that the urban heat island effect induces a convergence of lower-level air masses that intensifies rainfall over cities during the Indian summer monsoon. Simulations also showed that the presence of higher particle concentrations further invigorates the convective cloud systems and leads to more rainfall downwind of cities. More specifically, this study identified a linear dependence of urban rainfall on the spatial extent and amount of aerosols in the city. For mesoscale convective systems (intermediate-scale thunderstorm clusters), higher amounts of urban aerosols suppress the initial liquid-phase rain processes. As a result, excess moisture in the form of smaller cloud drops is lifted over the freezing level, which strengthens the ice-phase rain processes. Formation of more ice particles eventually leads to intense rainfall. However, because of the initial suppression, the time of rainfall is delayed. Thus, rainfall diminishes in the upwind half of the city and increases in the downwind regions of the city. Sponsors: The contributions of Pacific Northwest National Laboratory authors are supported by the U.S. Department of Energy Office of Science as part of the Regional and Global Climate Modeling program. The authors gratefully acknowledge the financial support given by the Earth System Science Organization, Ministry of Earth Sciences, Government of India (grant Nos: MM/NERC/MoES-03/2014/002) under the INCOMPASS project.